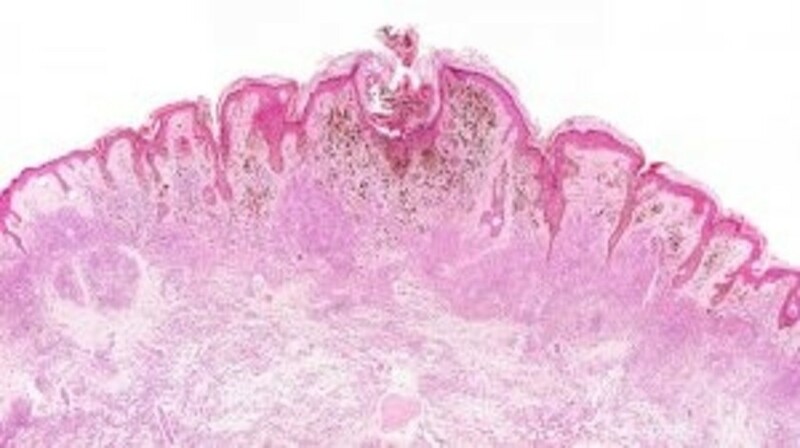 Melanoma results from a tumorigenic change in melanocytes of the skin. However, a melanoma is ultimately comprised of multiple cell types, including endothelial cells, fibroblasts, and inflammatory cells. The dynamic interactions between these cells maintain and support the progression of melanoma. Fibroblasts, in particular, play a prominent role in both promoting and maintaining tumorigenesis by laying down a supportive stroma . In normal skin, melanocytes are regulated through E-cadherin mediated interactions. Malignant transformation leads to downregulation of E-cadherin and upregulation of N-cadherin, permitting direct heterotypic interactions between melanocytes and fibroblasts . The transformed melanocytes secrete growth factors such as PDGF, TGF-β, IL-8 and bFGF that exert paracrine control over stroma formation by inducing the activation and proliferation of fibroblasts. Click here to view the full article in Melanoma Management.